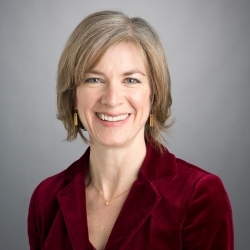 Jennifer Doudna is the Li Ka Shing Chancellor’s Chair in Biomedical and Health Sciences and she is Professor of Molecular and Cell Biology and Professor of Chemistry at UC Berkeley and an Investigator of the Howard Hughes Medical Institute. Prof. Doudna’s research seeks to understand how RNA molecules control the expression of genetic information. Her research led to insights about CRISPR-Cas9-mediated bacterial immunity that enabled her lab and that of collaborator Emmanuelle Charpentier to re-design this system for efficient genome engineering in animals and plants, creating a transformative technology that is revolutionizing the fields of genetics, molecular biology and medicine. She is a member of the National Academy of Sciences, the American Academy of Arts and Sciences, the National Academy of Medicine and the National Academy of Inventors. She is a recipient of awards including the NSF Waterman Award, the FNIH Lurie Prize, the Paul Janssen Award for Biomedical Research, the Breakthrough Prize in Life Sciences, the Princess of Asturias Award (Spain), the Gruber Prize in Genetics, the Massry Prize and the L’Oreal-UNESCO International Prize for Women in Science. I am particularly honored to receive this award in recognition of research conducted with my collaborator Emmanuelle Charpentier and our outstanding postdoctoral associates and students. We hope that future students are inspired by the value of curiosity-driven research and the passion for fundamental discovery that our work represents.